When it comes to your home comfort, temperature isn't the only thing to worry about. As your friends down south who are always complaining not about the humidity know, humidity can affect how the air in your home feels, it can cause physical discomfort or other health conditions, and it may even ruin your furnishing. While New York doesn't have nearly as much humid weather as southern states, you still might need a dehumidifier for your home. Humidity comes from both natural and man-made sources. If you like keeping your windows open during mild weather, you're probably allowing humidity into your home. This is especially true if you open your windows to feel the pleasant temperatures before or after a rainstorm. Even if you always leave your windows closed, humidity still follows you inside when you go in and out of your home, and moisture can also build up from things like snow you tracked in on your boots. In terms of man-made sources of humidity, showers and cooking are the biggest culprits — especially if you aren't in the habit of running your exhaust fans or if you don't run them long enough. Other indoor humidity sources include watering indoor plants, air drying clothes inside, and mopping. The most obvious sign of humidity is feeling warmer. This is in part because humidity interferes with the body's natural cooling system — sweat. When sweat evaporates, it pulls heat away from your body into the air, and when there's more moisture in the air, sweat can't evaporate as quickly. By decreasing the humidity inside of your home, you can turn your air conditioner up a few degrees and feel just as comfortable. Because dehumidifiers cost less to run than air conditioning, your overall utility bills will go down. According to the National Institute of Environmental health science, bacteria, viruses, dust mites, and fungi that cause health problems struggle to grow below 60 percent humidity and thrive at a humidity level of 80 percent. While these organisms won't be entirely killed off by low humidity, keeping your humidity levels below 60 percent can help keep you healthy year round. Mold and mildew also thrive in high humidity. In addition to the negative health effects from the spores they release, mold growth can lead to rotting wood or ruined paint and wallpaper. Additionally, you may see condensation form on your windows or even mirrors after large temperature swings or when there is a large difference in indoor and outdoor temperatures. This water may seep into and ruin the sealant around these surfaces as well as any surrounding wood or drywall. 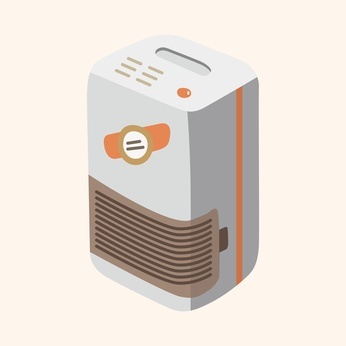 For this reason, you should keep a dehumidifier running even when you're away on vacation.